England's worst World Cup finals defeat at the hands of Germany dominates the front and back pages of the newspapers. The Sun tells the players they let their country down and says "awful England" can offer "no defence". The Sun and the Mirror have headlines adapting Basil Fawlty's remark about the Germans: "Don't mention the score." The Daily Telegraph summed up the 4-1 defeat in a cartoon showing a Saint George flag at half mast above a white van - and its shaven-headed driver. The Independent, meanwhile, says there are "no excuses" and the Daily Express calls the team's showing "woeful". The Daily Star's adjectives of choice are "inept" and "inarguably awful". The Guardian says England were "flat-footed" while the Daily Mail calls the performance "collective surrender". 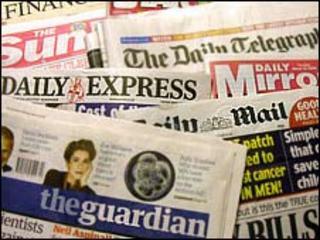 All the papers agree with the Times that the one saving grace has been the behaviour of the travelling supporters. It says South Africa has restored the reputation of England's fans. The future of England coach Fabio Capello is also under scrutiny, with the Sun saying he should go and the Mirror urging him to "quit in shame". The Star and the Express say it is time for the team to have an English coach. But the Telegraph reminds the UK that "one in two Britons was doing something else yesterday". The hottest day of the year so far makes many of the papers, with the Sun hailing Brighton "balmier than Bermuda". In other news, the Guardian says Glastonbury festival, celebrating its 40th birthday, was the best ever. The Times reports that former MP Ann Widdecombe has been asked to become the next British Ambassador to the Vatican. Meanwhile, the Mail has calculated how much the average woman spends on shoes. It says a study shows women own 19 pairs of shoes at any one time and end up splashing out £16,000 on footwear. Four of these are "foxy footwear for nights on the town", it concludes.